User friendly Windows software CAPPS. 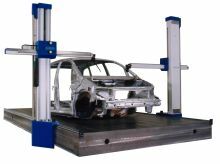 "Click and Control"
The coordinate measuring machines DIMENSION and DIMENSION-TWIN were especially designed and constructed for use in harsh conditions where fast and precise measuring is paramount. Here only low-friction precision linear guides of the highest quality are used. Air bearings in combination with granite guides can be used when higher accuracy is required. As with all our CMM machines, the motors and guides are sealed. This helps assure protection from dirt, damage, and thermal influences. Highly dynamic, high quality servo-motors provide an exact and vibration-free positioning. 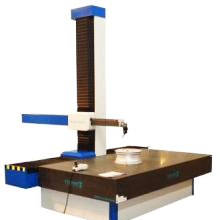 The CNC-controlled coordinate measuring machine can be equipped with all Renishaw probes. Also the SP25 scanning probe can be used. Thus in a very short time, high amounts of points are added (up to 100 points / sec). The measuring machines DIMENSION and DIMENSION TWIN are "Made in Germany".